From Rougemont, which was once the priory of Cluny, the trial goes over the Kirchenhügel from Château-d'Oex to the Grand Chalet of Rossinière. It goes between the rushing Saane and landscape steeped in history, moulded by the mountain farmers. The trail starts in Rougemont at the foot of the imposing peak of the Gummfluh. The village has several architectural gems, such as the old timber houses with their richly decorated façades or the priory church, a prominent testimony to the religious heritage of the region. From Rougemont, the trail follows the course of the River Saane, past the hamlets of Combes and Gérignoz and leads over a track to the waterfall of Ramaclé. After this water meadow zone, Château-d'Œx can be reached by crossing the Turrian bridge, one of the few suspension bridges in West Switzerland. In the middle of the village one can climb up to the Colline du Temple, the Kirchenhügel (Church hill) and enjoy a rewarding view of the old village centre. The trail turns towards La Chaudanne, where the Saane is crossed over the bridge of Grangettes. It continues through meadows to Rossinière. The place is renowned for its outstanding timber architecture, particularly the Chalet de la Place and the famous Grand Chalet, where Balthus spent his final years. In the middle of the village is the Balthus chapel, which commemorates the artist. Signalization: From the train station of Rougemont-Village, follow the yellow marked trail in the direction of le Crêt. From Le Crêt, go on the direction of Gérignoz and then the direction of Château-d'Œx. From Château-d'Œx, take de direction of La Frasse, and then La Chaudanne. From La Chaudanne, follow the direction of Rossinière up to the village. 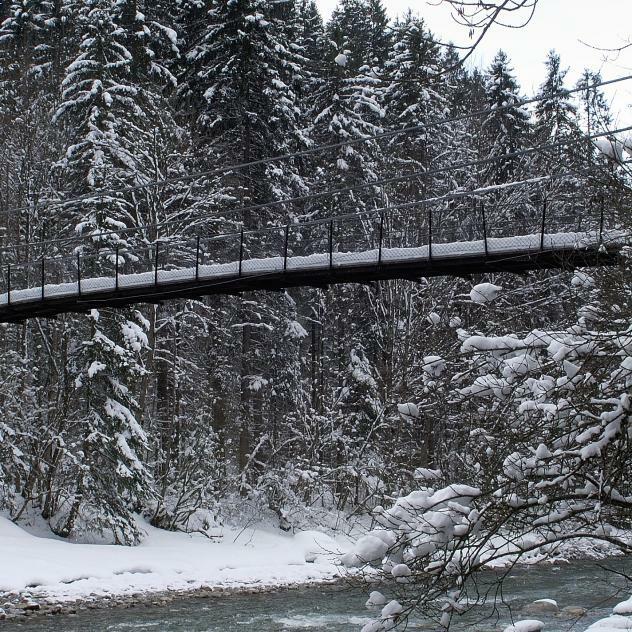 Built in 1883, the Turrian Bridge is the oldest suspension bridge in Romandy Switzerland and one of last still standing. The bridge, reachable on foot from Château-d’Oex, spans the River Sarine and leads into the Ramaclé alluvial zone, notably famous for its magnificent waterfall.